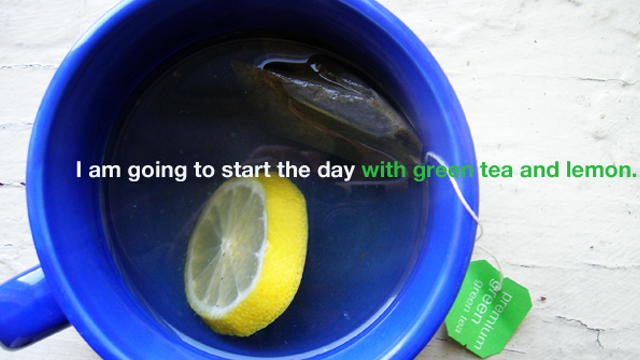 Green tea is an amazing elixir. You might be able to reap even more health benefits from your cup of tea by adding lemon, according to a few studies. Catechins, the main health compound in tea tied to reduced risk of cancer, heart attack, and other diseases, unfortunately isn’t absorbed very well in the intestines. After digestion, less than 20 percent of catechins remain. In two studies, however, Purdue University researchers found that adding lemon juice, other citrus juice, or vitamin C helped the body absorb as much as 13 times the healthy catechins than normal. The addition of lemon juice caused 80 percent of the catechins to remain. The studies tested the effects of absorption with both rats and a human digestive model. The researchers note that if you don’t want to squeeze a lemon into your cup, you could also just have a glass of citrus juice with your green tea or look for ready-made products that have 100 percent of the daily recommended vitamin C. It’s also worth mentioning that one of the studies also showed adding sugar with the lemon juice helped absorption, but sugar isn’t required. Although a human clinical trial hasn’t been concluded yet, another study of over 42,000 Japanese men and women found that eating citrus fruit every day and also drinking at least one cup of green tea a day was significantly correlated with reduced cancer risk.